If you are looking for a dark horse in the welterweight division, perhaps Jeff Horn is your man. Horn, the reigning WBO welterweight champion, is in line for an April 14 defense against former two-division world champion Terence Crawford that appears to be set for Las Vegas, most likely at the Mandalay Bay. The Horn vs. Crawford match is compelling in its own right, but Horn himself has begun to stand out as more than just a subplot in today’s discussion of supremacy in the welterweight class. After his upset over Manny Pacquiao in July of last year, Horn introduced himself as a champion with heart, balls, and brass. Horn retained his belt in December after a stoppage victory over London’s Gary Corcoran, and is on a steady upswing with everything regarding his career. And it’s very interesting to assess Horn’s future, win or lose, after Crawford. One thing that is for sure, is that the rugged and affable Australian is eyeing all of his options at this point. According to a recent report from Sky Sports.com, Horn is eyeing all of his options and recently expressed interest in a future fight against former champion Amir Khan. Horn must be mighty high on himself to envision opponents after Crawford, yet he still admits that a fighter like Khan, still one of the biggest stars in the game, is on his “radar”. “I had a chance to speak to him at the weigh-in. He seemed like a pretty decent bloke,” Horn exclusively told Sky Sports in a recent Q & A. For Horn, ever the businessman since becoming champion, it’s about dollars and sense (cents). Khan is slated for his own fight, on April 21, when he will return against contender Phil Lo Greco, and he has already begun training following an intense pre-fight face off with the outspoken Canadian. 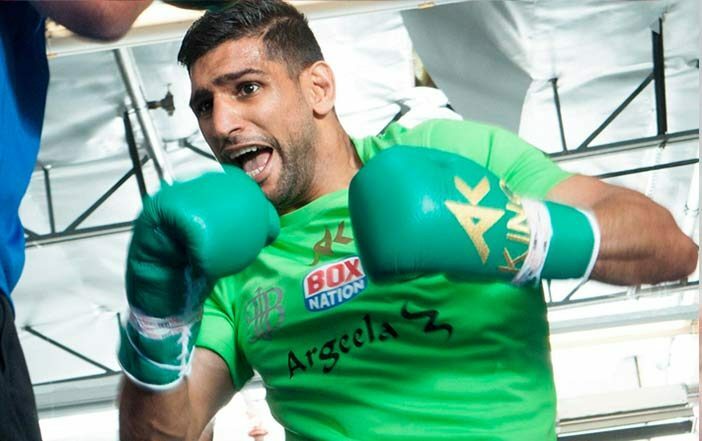 It is Khan’s fist fight dating back to his brutal knockout loss to Canelo Alvarez in May of 2016 and Horn has his doubts whether we will be seeing the same Amir Khan. “Amir Khan is a very skilful boxer. He’s quick, but he’s been out for a while now,” said Horn. “When he last fought he got knocked out against ‘Canelo’ in his last performance. He’s probably going to need a bit of a comeback fight and then he’s going to prove himself again. “I hope he does well, but I don’t know if he’s still got it in him or not,” Horn added. All these two have to do is keep winning and we may see them facing off next.